When you go to a lecture and your speaker appears wearing a kid’s tiara, does it make you wonder if you’re in the right place? 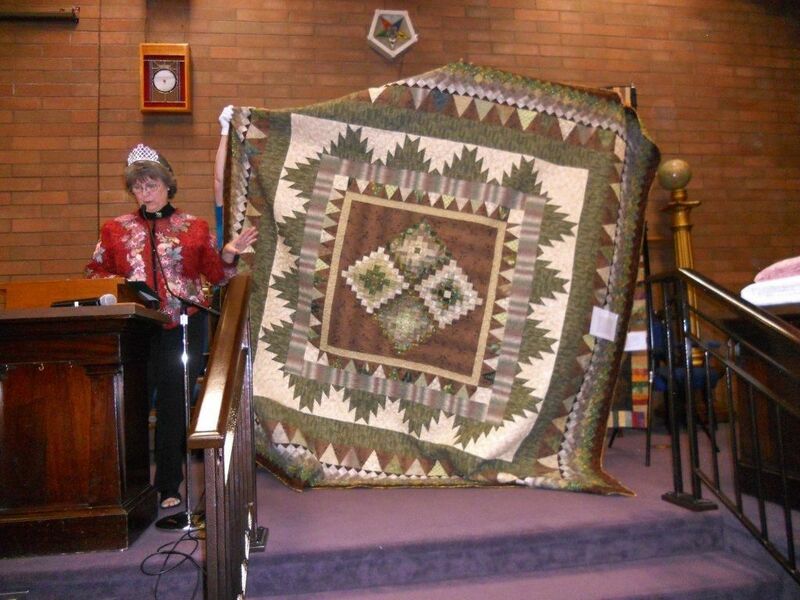 I was invited to be the Emerald Valley Quilt Guild’s “Mystery Speaker” for June, and gave my presentation last week to the guild. Kudos to the guild members for staying in their seats! One of my great hopes is that the many quilts tops now stored in boxes and drawers will be quilted so they can be admired and used. The topics covered included design choice and inspiration, working out a plan for your quilt, and investing time in trying new techniques. Leave no quilt unquilted! My quilting journey began in earnest eleven years ago, and nine years ago I began longarm quilting for clients. Quilting for clients uses my time, and a lot of my own quilts are yet unquilted! 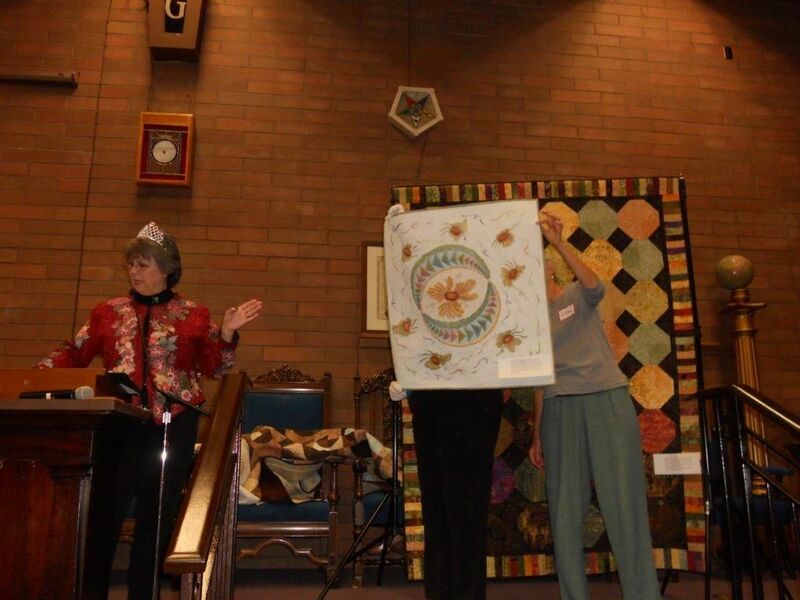 To do this presentation I needed to beg, borrow and nearly steal completed quilts from my clients, friends, and my parents. 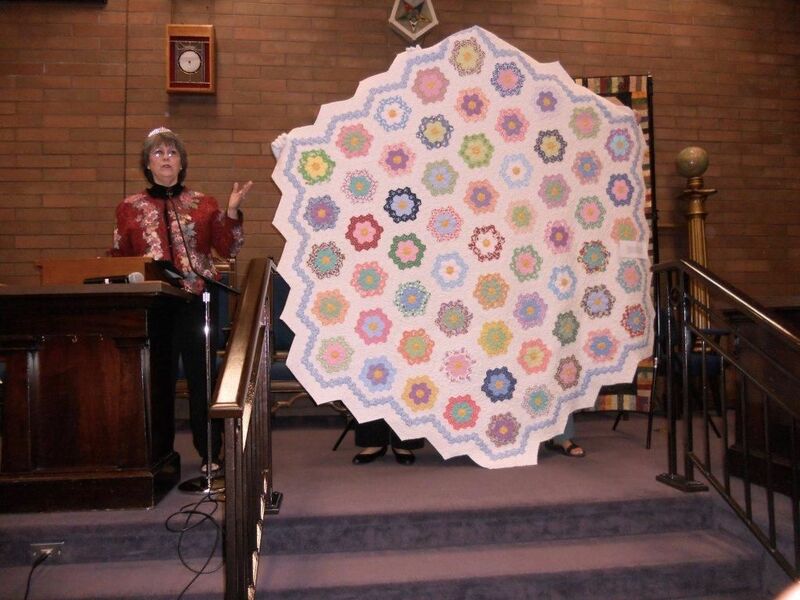 No quilt was harmed during this presentation (whew!) and all were admired. 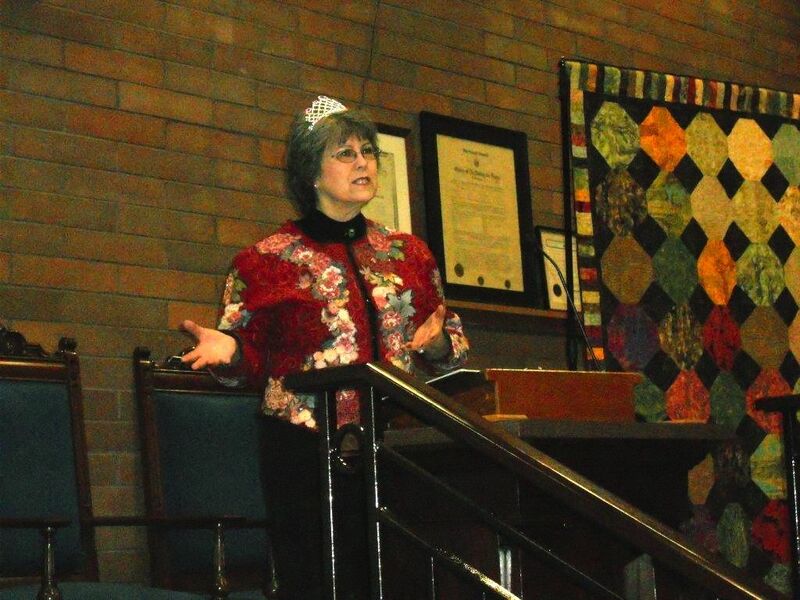 The quilts on the stands behind me are my own, and are actually NOT the best representations of my quilting. Most of my best quilts belong to other people! We did show this lovely quilt that I made and gave to my mom and dad. For two or three years I was rather engaged in doing Trip Around the World quilts, hand piecing them. This quilt started with four orphan TAW blocks that just needed a quilt to set them off. As I built around the center I realized this quilt would look great in my parent’s home. At that point it measured about 60×60. I called my mom and was rather astonished to hear that the quilt would need to be 102×102 in order to work in their room! 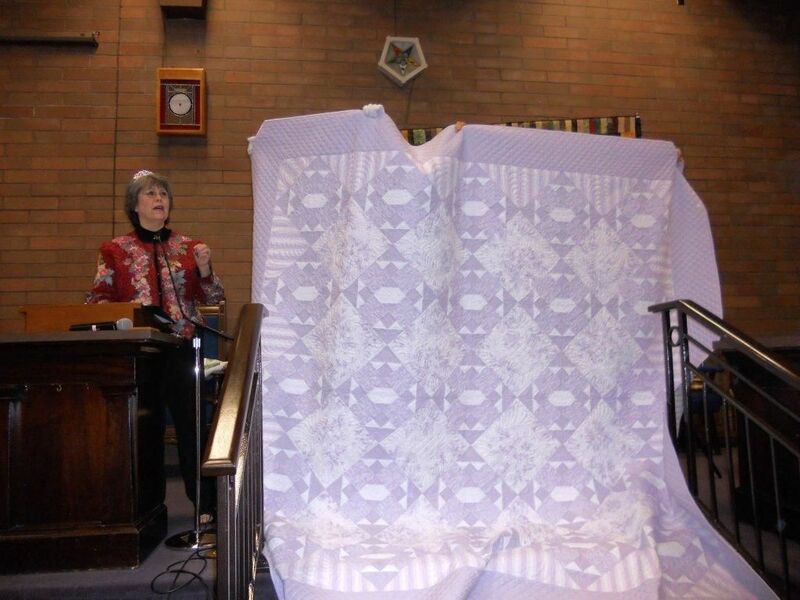 The quilt was loaned back to me for this lecture on the condition that I apply a label documenting it…The quilting in this piece is a medium density, lots of ferns and feathers. I wanted a very soft quilt for my parents. 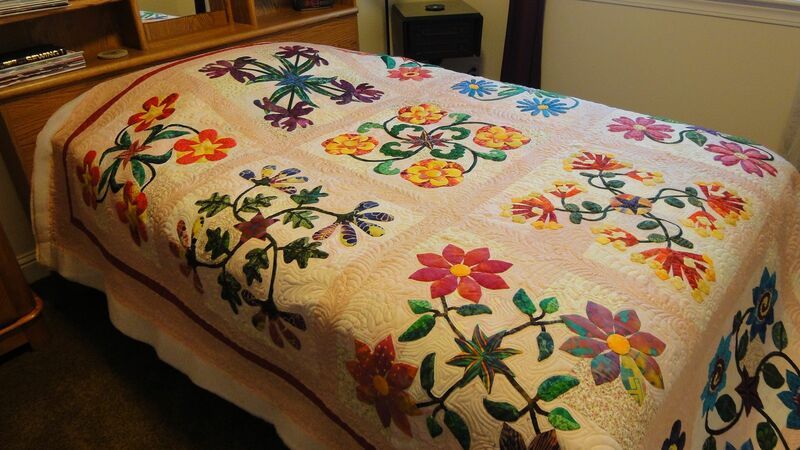 This is a quilt I hand pieced, a Grandmother’s Flower Garden, using 30’s Reproduction fabrics. I decided to make it a large hexagon instead of squaring it off. I use it as a lap quilt on cold mornings and as a floor quilt for the gkids when they’re watching television. This is the third GFG I have done. Each one had a slightly different quilting treatment, but my favorite for this type of quilt is a simple continuous curve around every patch. 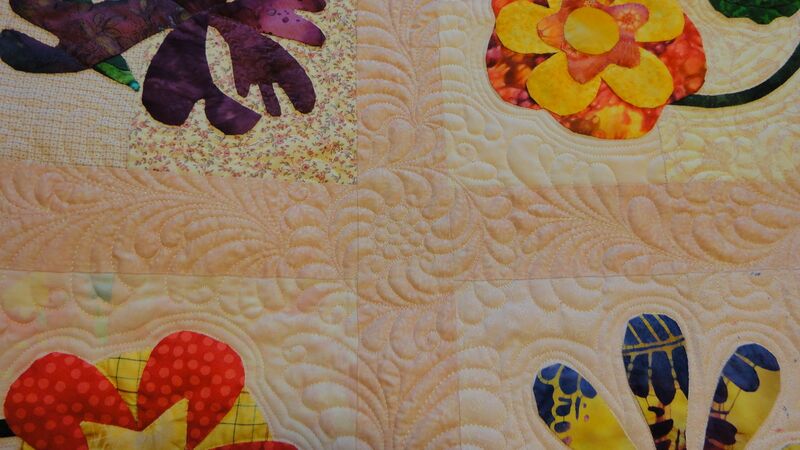 The magic in this quilt are the small patches, no need to over-quilt it. 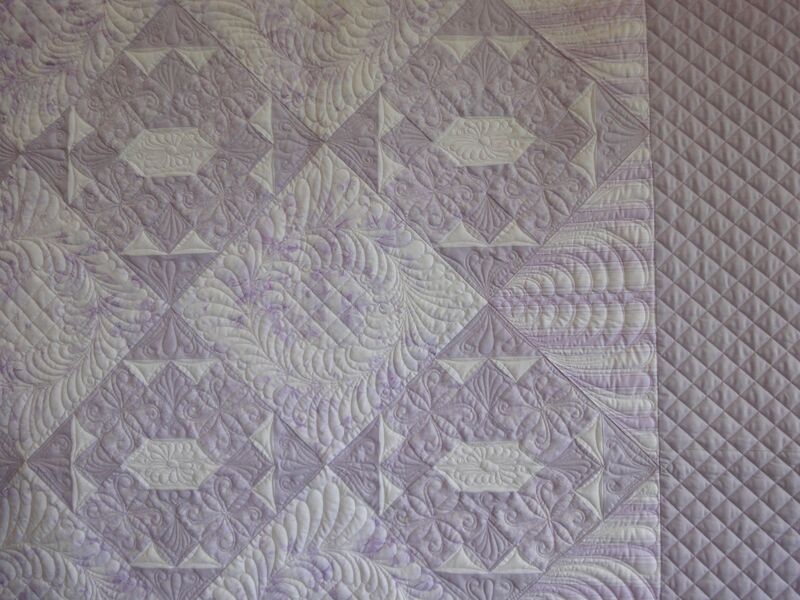 “Love of Lavender,” pieced by Helen Andrews, of The Quilt Patch in Eugene. This quilt is entered in the AQS Grand Rapids show this coming August. 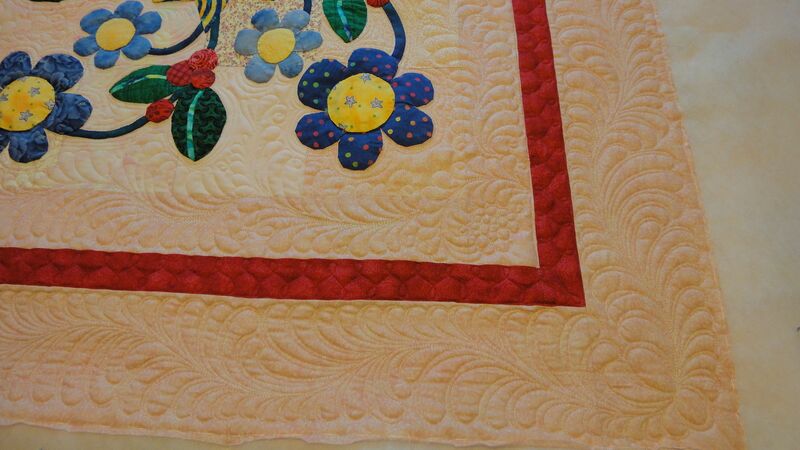 It is a beautiful quilt with lots of quilting space. One more quilt from Helen Andrews that shows both of our work to great advantage is “Stars in the Garden.” The pic here is from my guestroom, where most quilts spend at least a few moments while I photograph them and admire them for a bit before I turn them over to their owners! I enjoyed quilting this quilt immensely. Since the background color and the sashing were very close in value, I just quilted over into the block backgrounds to create a flowing space around the flowers. And finally I was every excited to share this densely quilted show winner. I learned so much from making this little quilt, which is the point of the whole process! 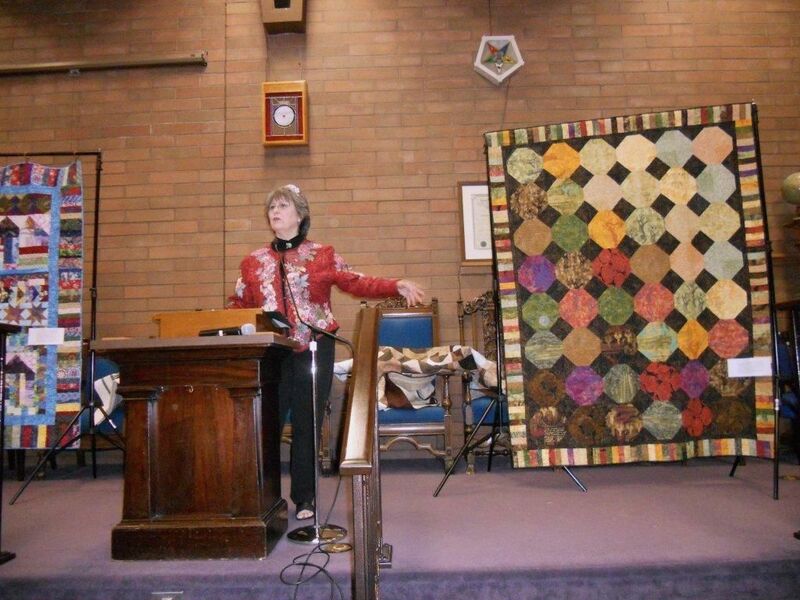 Thanks so much to the Emerald Valley Quilt Guild for hosting my presentation. I hope they are inspired to transform their quilt tops into quilts! Loved seeing your quilts! Thanks for sharing some of your secrets!! Your mom was smart, insisting on a label and shame on you for giving one away without it! PS the tiara didn’t surprise me one bit!!! Aren’t we all quilting divas? I am very lazy about applying labels, although I always insist other people should have them on their quilts. I have been arrested a few times over this issue, but was able to enter a diversion program to keep the charge off my permanent record. Your jacket is gorgeous too! That quilt for your parents is outstanding! Thank you for the comment about my jacket. It was made for the EVQ Garment Challenge in 2010, and was honorably mentioned during that competition. I love the collage technique, and it also has beads and French Knots and…well, who doesn’t like a little sparkle?